The explosive growth of the telecom industry in Los Angeles county faces many challenges on a daily basis. From cell tower installations to wireless and wireline Infrastructure upgrades, billions of dollars are spent annually on outsourced construction engineering, installation, maintenance and repair for major telecommunications firms. To meet the demand, they must face another equally formidable challenge – maintaining traffic control on the busy streets of L.A. Fortunately, the Los Angeles telecom industry can rely on Roadway Construction Service (RCS) for all their traffic control needs. 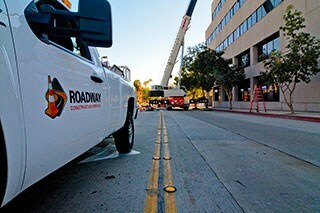 RCS has earned a well-deserved reputation as the safest, most economical traffic control service for telecom contractors in Los Angeles – and throughout Southern California. Widely acclaimed for our telecom expertise, we consistently save companies both time and money — without compromising safety – Ever. In fact, dedication to job-site SAFETY is one of the RCS hallmarks that distinguishes us from other Los Angeles traffic control services. Our exceedingly high safety standards are evident at every job site we support. Safety begins with the individuals who comprise the RCS team. All of our job site personnel, including traffic control technicians, undergo thorough training – not only for today, but for tomorrow. To stay current, RCS personnel must attain multiple certifications and qualifications, such as the RF Awareness Training. Additionally, RCS traffic control technicians are trained to perform a substantial amount of crane work for the telecom industry, providing expertise as needed. At RCS, safety is complemented by adaptability. Offering the most extensive selection of personnel platforms in the state, RCS personnel can handle virtually any traffic control situation — 24/7/365. Fully qualified for the challenges of municipal traffic control, RCS is consistently prepared to serve the demands of the telecom industry – whatever needs should arise. If these needs change, we have the reflexes and resources to adapt with uncommon speed. At RCS, safety-training and experience merge perfectly with a commitment to the highest level of service and unmatched job-cost efficiency. This powerful combination provides us with a competitive edge and enables us to deliver extraordinary value to our telecom customers. If you’re interested in learning more about the traffic control service that offers tremendous value and the assurance of unsurpassed safety to your telecom company in Los Angeles, contact RCS today. You’ll soon discover why we’re the go-to traffic control service for the telecom industry.